Smart Marketing combines the effectiveness of direct mail and the vast online reach of Google to increase response rates and branding of your business. We can do that too. Talk to our Account Executives about it. Postcard marketing has been our bread and butter for over 17 years. Our complete package includes the design, mailing list, printing, addressing, postage and delivery to post office. We optimize our postcard campaigns for the highest response rates possible. We do this through the use of high quality mailing lists, precision targeting, and extensively tested designs. Call us to learn more about our mailing lists, targeting, and designs. Advertise to the right person at the right time with Google Display advertising. Most of the websites your customers are going to are part of the Google Display Network. Google then stores all sorts of advertising data on those people and makes it available to advertisers like us. We will setup your ads with advanced demographic, interest, and geographic targeting to get your message across to potential customers. We have experts on staff that utilize this targeting to show your message to customers most likely to buy from you. 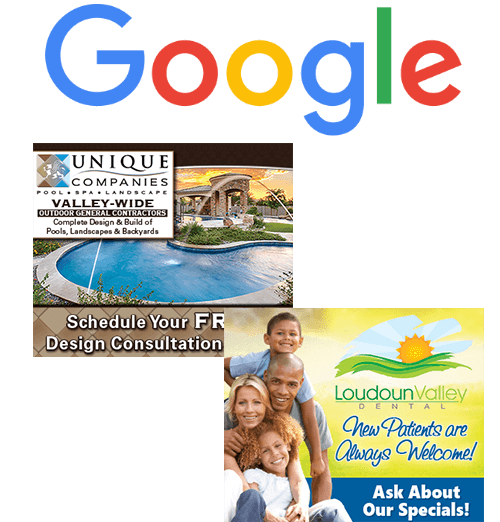 See how Google Display advertising can work for your business by calling us today!